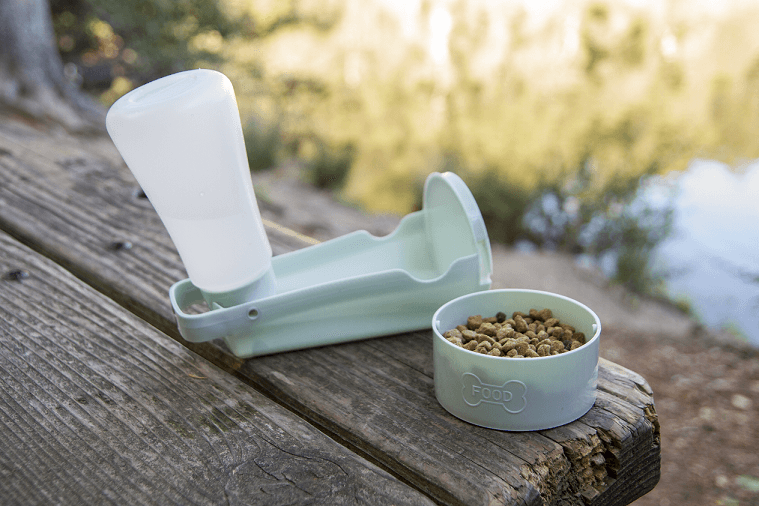 Poochables to Go is a portable dog food and water bowl designed for travel, road trips, the dog park and more. The Pooch Company is the sponsor of this post. 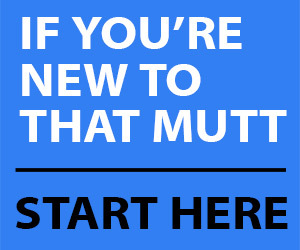 Use code thatmutt for free shipping on your first Poochables to Go food and water bowl. Order here. The company is also giving away a Poochables to Go dog food and water bowl to two readers of That Mutt. Leave a comment at the end of this post to enter the drawing. Poochables to Go is a brand new product so we feel special we got to test it out so early. Like I said, it’s perfect for trips to the dog park or dog beach, the lake, boating or agility class. 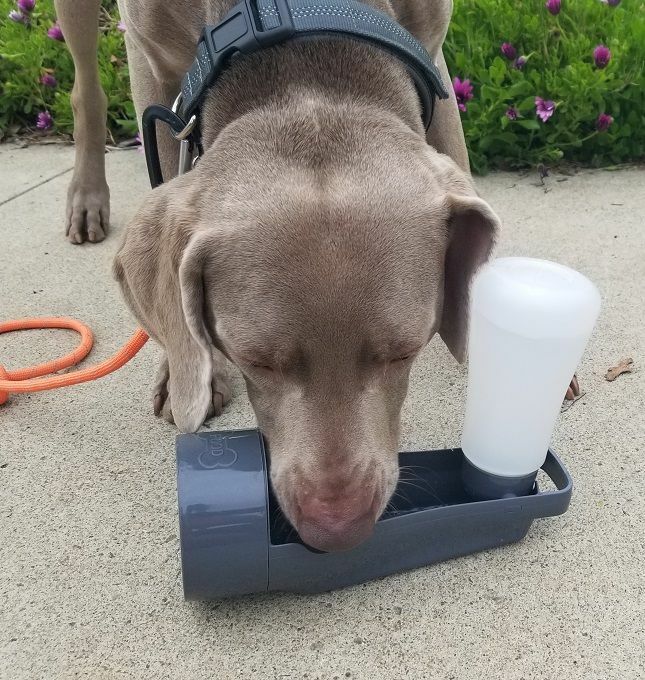 I drive my dog Remy to local running trails several times per week, and Poochables to Go is perfect for storing his water for when we get back to the car. The product works well for my two large dogs (60 and 65 pounds). As you can see in the video, Poochables to Go is easy to use. The bottom piece is a small food bowl that holds 9.5 fl ounces. To open, you just squeeze the bowl and rotate counter clockwise. It’s designed to lock in place, so when you reattach the food bowl you should hear a click sound. This is a good place to store a few treats if you’re taking the product on a walk or to a dog training class. If you’re traveling with your dog for the day, it’s a good place to store a meal for your pup. 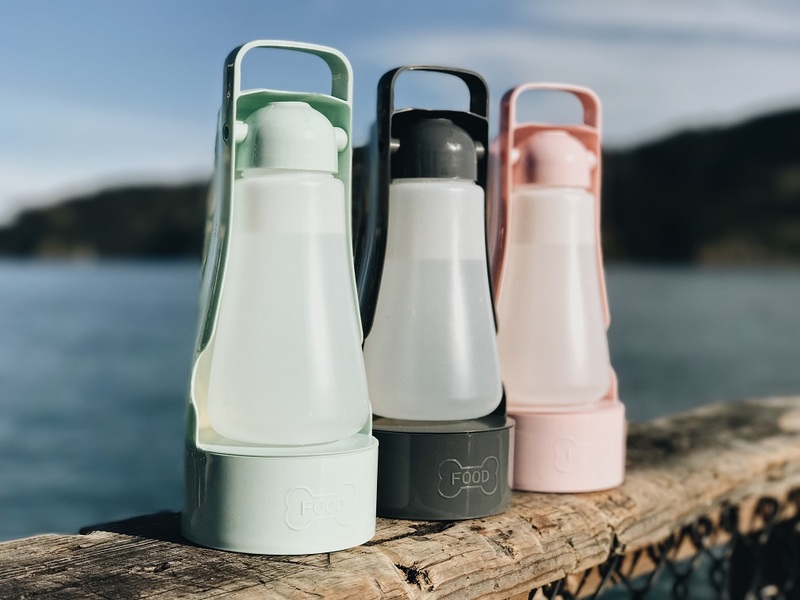 The water bottle piece comes with a removable washer inside the bottle’s nozzle. This is removable for proper cleaning so bacteria doesn’t accumulate inside the nozzle area. 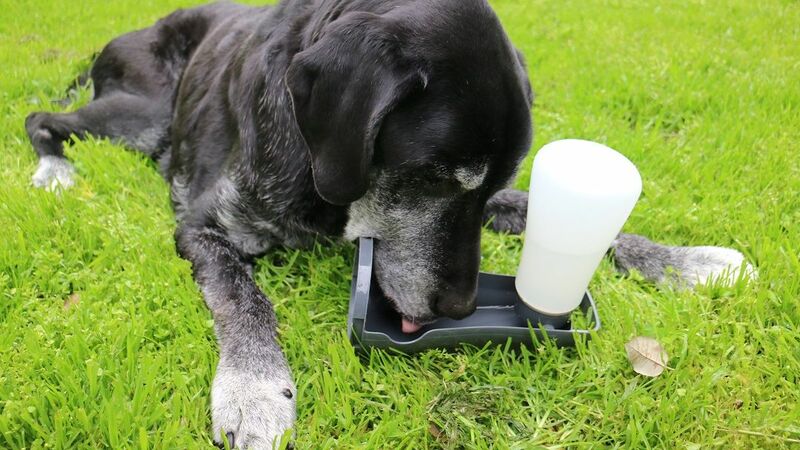 To give your dog a drink from the bottle, just flip the bottle up and squeeze it to let out as much water as needed. My dogs did not hesitate to drink from the Poochables to Go bowl. A Poochables to Go food and water system is $19.99 on its website. Gina Lucia Brucato is the founder and CEO of The Pooch Company, which launched in 2017. She said she launched the company with the mission to provide premium pet products that unite functionality and modern designs that pet parents are proud to own. Poochables to Go is the company’s first product, and it was originally created to make outings with Gina’s rescue dog Huxley less stressful. Before Poochables to Go, Gina said she would pack Huxley’s food in plastic containers, his treats in plastic bags and bring water bottles and bowls. Poochables to Go definitely makes these types of outings less stressful! I really like Poochables for outdoor activities like Remy’s obedience class (held outside in a field). The bottle stores just enough water for these types of shorter outings, and it’s not too heavy to lug around. It’s perfect for agility class or trips to the dog park or dog beach. We will definitely also use this on road trips. Much easier than pouring water into a bowl while in the car! I wish the product was slightly sturdier for my big dogs. Poochables to Go is a brand new product and I expect the company will continue to make improvements with it. This food and water bowl was not a good choice while out running on the trails with Remy. It’s too big to carry for running. However, we typically drive to the trails so this is perfect to have in the car for Remy immediately after our runs. *The giveaway has closed. Congrats to Jeannie C. and Sonya. The Pooch Company is giving away a Poochables go Go food and water system to two readers of That Mutt. To enter, all you have to do is leave a comment below so I know your dog wants IN on the drawing. Let me know where you would use your Poochables to Go if you had one. Hiking? The dog park? I’ll choose the two winners at random on Tuesday April 10. And yes, must have a U.S. mailing address to win. In the comments, let me know where you would use a Poochables to Go bowl! Please share this Poochables to Go review if it will interest someone you know. That Mutt’s Patreon members receive automatic entries into all the blog’s giveaways, including this one. Join us here to support the blog. Thank you! I would use this when taking my dog on outings for the day….like when she is going to the groomer or another dog friendly place. I have two Yorkies, Cody and Roxy that travel with me ever. Parks , hikes, long rod trips and the poochables would make our trips easier! I could use one of these when I take my dogs to our farm. No bugs in the water bowl or spilling water all over. That is ingenious. I have a portable water bottle already, but this one is even better as it has the food bowl attached. Love it. I would take this portable water bottle on my hikes with my mutts. It looks easy to carry and it even holds food or treats. I think my dogs would love it. I love the compact size and convenience. As a dog walker in Florida, I always give the dogs a water break even during a short walk. The Poochables To Go food compartment would be perfect for treats as well. 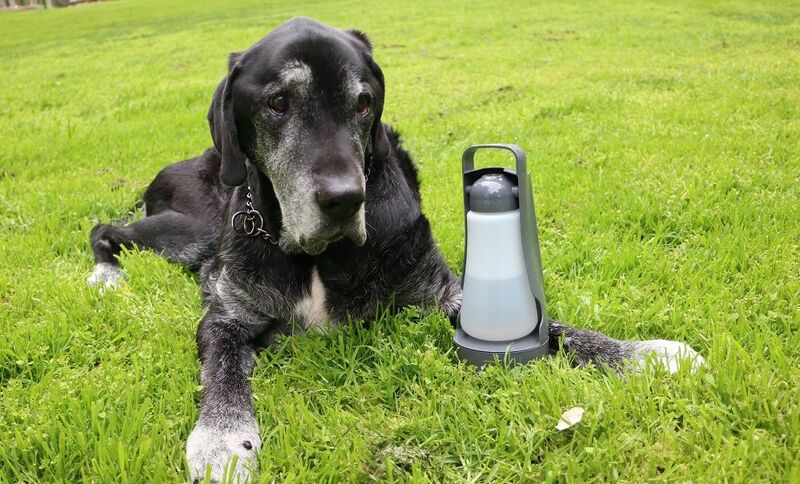 Love this idea for taking Clementine on a hike, or even a long walk in the hot summer. She loves exercise! I would love this for Spirit. When we go to the park on the weekends this would be perfect and truly convenient. I would use this when I take Lambeau to play and run in the big field here at our development. It looks perfect for carrying treats to work on some training, and the water bottle/dish combination looks great. No carrying a bottle AND a water bowl! I think we would use this in the car, too, when we take him with us. It would be a handy way to give him a drink or treat easily. She is a dark brown dog who can get hot very easily. I would use it at the park, walking at the beach and travels in the car. The winners will definitely get to pick the color! My husband and I do a lot of traveling and our Duke (Boxer) always goes with us! We carry plastic bowls in the car with us for him and this would work out so much better! Also, my son just rescued a dog and plans on taking him on climbing and hiking trips, one of these will be great for my Grand-dog too!!! I’d like to try this when I take them out to run in the timbers. It’s private property belongs to my cousin and the only off leash fun Otis has cause of his stranger danger issues. Right now I carry a knock off dollar store version of the snack ease which does the trick but is a little uncomfortable to carry. My dog — Phil — short for Philippides — the first person to ever run a marathon — would love to rehydrate with one of these after our early morning runs! this one sounds better than the others i have seen. i normally take bottled water and a foldable cup with me. the one that i had years ago, leaked, so i never used it. it was also heavy when it was filled with water. i like having a cup attached to the water though, very convenient. This would be great for Sadie to use on car trips when we visit family and go to the beach. I really like how convenient and easy this looks to use. This would be great for the dog park instead of Posey using the community water bowls! Lily-Mae luvs Poochables and so do I, her Daddy! I take my dog to the park and on hikes, and I’d love to have an easy solution for dog food and water on long road trips. Once a year we go from Austin Texas to Billings Montana, and we bring our little black mutt with us all the way up. It’s always kind of a hassle to dig up her bowl and water, etc. Manageable, but this would definitely make things easier. I go hiking with my 4 dogs all the time. Bringing a water bowl is bulky so having one of these would be ideal. Love The Mutt. Very helpful and informative. Thank u keep up the great work. My three boys love watching me have control more and more. This would be perfect for hikes with my pup Coaly and to have in the car for after our runs. Such a cool idea! I’d love to win for my running/hiking/adventure partner Dream. Hydrating and fueling on the go looks like it would be a breaze. I have never even tried to understand dogs. So with these new lessons, I am learning quite a bit. I wish that I knew all this stuff from my last dog. I’ve only had two dogs. (I’m more of a cat person). My dog was given to me to help with the cattle; however, my husband has surgery when Dawg was just a pup and I never got him trained. So, with all of this help, I’m training him myself.